Just before Christmas last year, I received a phone call from fellow Victoria birder Jeremy Kimm saying another January Westport pelagic birding trip was scheduled. The January pelagic trips are notorious for pulling in rare albatrosses and also for being cancelled. The last two trips to go out in January were in 2000 and 2001, which not only resulted in several Laysan Albatross sightings, but one had a Shy Albatross and the other had a Short-tailed Albatross, respectively. Jeremy K. said there was a reserved spot with my name on it if I wanted, so I jumped at the opportunity. We also recruited our good friend Nathan Hentze, currently residing in Burnaby, to get in on the action and he promptly signed himself up with the prospect of finally catching up with Laysan Albatross. In fact, that was all the incentive needed for all of us. The allure of a mega rarity was just an added bonus. Fast forward to the afternoon of Thursday, January 26th. Jeremy K. and I had caught the 5 p.m. ferry over to Tsawwassen and were heading to a skytrain station to pick up Nathan. While grabbing something quick and dirty to keep us fueled on our drive down to Tacoma, we received an e-mail from Westport Seabirds saying the weather was looking decent and it appeared the trip was going to sail. Elated with the news, we picked up Nathan, headed south of the border through the Peace Arch border crossing, and rolled into Tacoma around 11:30 p.m.
After beers and stories to around 2 a.m., we took in a meager five hours of sleep and were up and eating breakfast at IHOP at 7:30 a.m. I dared to be different and got chicken and waffles. We hit the I-5 and continued south towards Aberdeen and, after passing through Olympia, we got a call from Westport Seabirds saying the weather forecast had changed and winds were expected to pick up to 35 knots. Another January trip axed. Feeling a little dejected, we set a modified version of our back-up plan in motion. We decided if we were already south of the border and we received notice that the trip was canned, we would head north up to Dungeness Spit and search for the two Emperor Geese that had been reported on and off for the past four weeks. That plan only worked if we received the notice late Thursday night or very early Thursday. As we were already south of Olympia, we opted to continue on to Ocean Shores which has also hosted an Emperor Goose for around two months. Additionally, Damon Point, a few kilometers south of Ocean Shores, has had a female King Eider that was first sighted back in July of 2009. 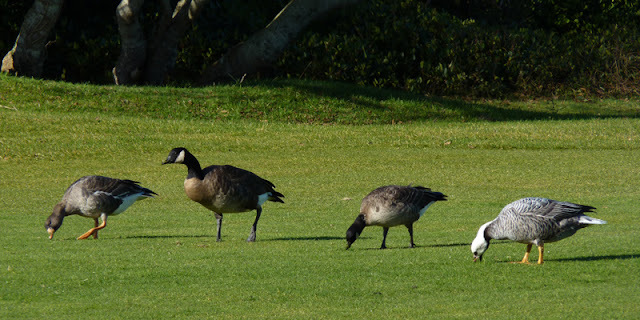 Once in Ocean Shores, we managed to locate the golf course where the Emperor Goose had been regularly sighted. It wasn't long before we found a group of Canada Geese so we hopped out and checked through them. That would have been the easiest twitch ever, but alas it was not in the group. For non-birders, a "twitch" is birding lingo for chasing a rare bird. If you attempt to "twitch" and miss the bird, it is called "dipping". Luckily we did not dip on the Emperor Goose. We hopped back in the car and drove down the next road which offered a view down another fairway. There were two small groups of geese and a quick scan through the closer group revealed a grey-backed goose with a black neck and throat and a white head. 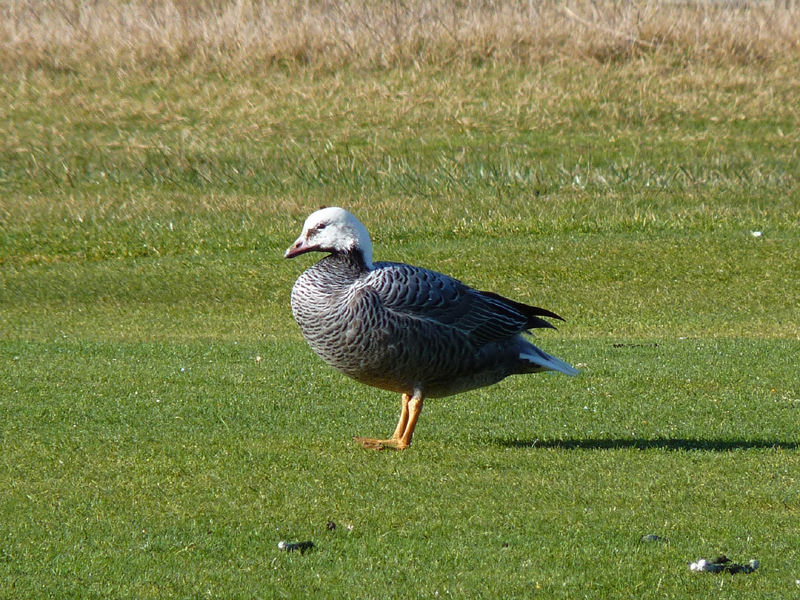 We got out the scopes and enjoyed great views of the Emperor Goose as it helped maintain a nicely manicured fairway. The rest of the flock containing the Emperor was made up of two Greater White-fronted Geese, two Dusky Canada Geese, and a Cackling Goose. I took a bit of time to get a photo showing all four geese taxa together and managed the above shot. The Greater White-fronted can be distinguished by its pinky-orange bill with white feathers at the base, hence "white-fronted", while the two different white-cheeked geese can be separated by size as the Dusky Canada slightly dwarfs the Cackling. The Emperor Goose has many diagnostic features, such as the strip of black running up its neck and throat contrasted by a white head, the heavily scalloped chest and back, the overall grey tone to its body, and a white tail. The cooperative Emperor, significantly south of its typical winter range, was a lifer - that's birding lingo for a bird you've never seen before - for both Jeremy K. and I, while Nathan had seen a dozen or so up near their breeding range in western Alaska. At Damon Point, we quickly located a mixed flock of scoters and were optimistic the female King Eider would be floating among them. Sure enough, Nathan spotted her in short order. The eider stood out due to its rich brown colour, distinct head shape, and sail-like tertial feathers. There were several other birders wandering around Damon Point, mostly to experience the Snowy Owls further out along the point, and we took the time to chat to a few and point out the eider. We scoped out along the sandy point from the base in hopes of spying a distant Snowy but could only see where one was likely huddled out of our view. One birder told us the same disgraceful behaviour that has been going on at Boundary Bay near Vancouver is happening at Damon Point. Bird photographers have flocked to locations hosting multiple Snowy Owls and the stories are less than flattering to the bird photography community. The issue is exacerbated as interested onlookers see the owls and want photos of them, too, so they trudge out there with camera phones or short-range point-and-shoot cameras with no understanding of bird behaviour. The end result is a daily omnipresence of humans disturbing the owls and it sickens me. Needless to say, we did not walk out to see the owls at Damon Point. As we walked back to the car, we saw park rangers heading out there and we can only hope they were going to educate offenders that are harassing wildlife and perhaps even send a message with a fine or two. From a fellow birder, we learned that the Point Brown jetty, just to the north, had Rock Sandpipers in with a group of fellow rock-loving shorebirds so we decided to make that our last stop before heading back north to the border. What we saw next was foreshadowed as we stepped out of the vehicle and had a couple of birders tell us they had just done the beached bird survey. I must have misheard the numbers, but I caught that they had found a dead Rhinoceros Auklet and a dead puffin. The scene there was easily more disturbing than the harassment of the owls, but the human side of the picture was thankfully more compassionate. 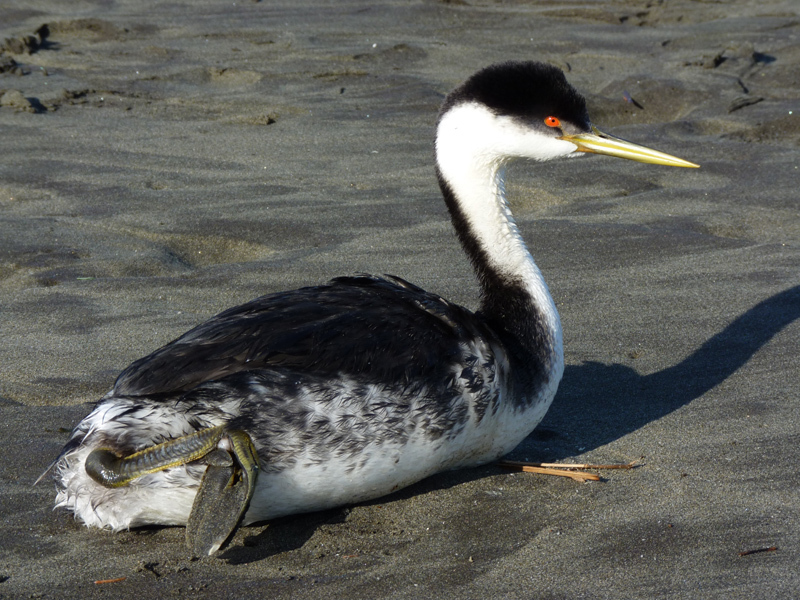 As we approached the beach, we could see a couple standing above a Western Grebe that was stranded on the shore. We approached them and learned they were talking to the local Audubon Society to find out how they could help the bird. A family was sitting on logs and watched on with concern. We then noticed there was another Western Grebe closer to the rock jetty. I walked up to it and could see it was less lively. I turned around and saw Nathan was closer to the water's edge looking at a struggling Ruddy Duck. 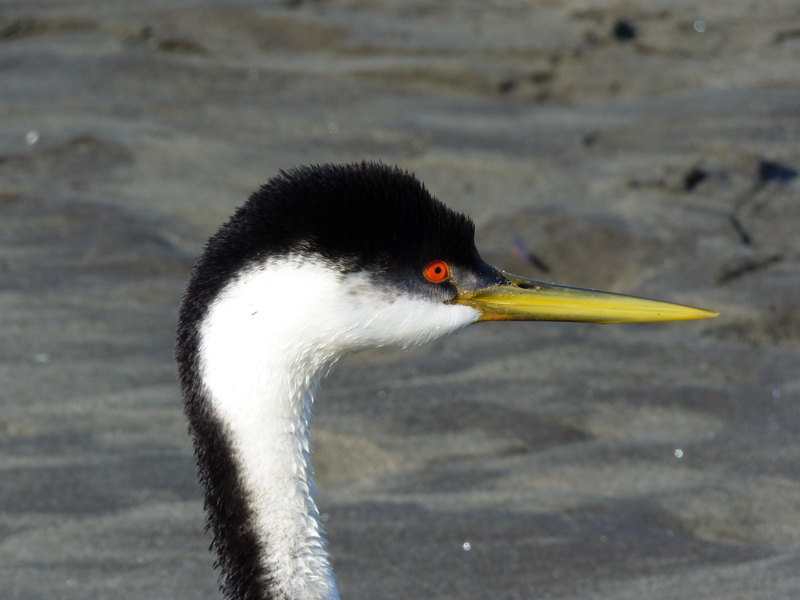 The three of us had never witnessed a stranding event and it was quite heart-wrenching to have a helpless Western Grebe looking up at you and calling, seemingly in distress. At the time, we could only speculate why the grebes were stranded and couldn't tell if they were oiled or not. Both grebes had disheveled feathers on their flanks and towards the back end of their body, but there was no obvious signs of oil. What we did know, however, was they were stuck once on land and were unable to walk or take flight. I found an article from 2001 when a similar event happened at Ocean Shores. Strong winds, similar to those experienced a week ago, was the culprit then and could well have been underlying cause of what we were witnessing. The article goes on to say that the grebes are not only susceptible to starvation, but sand and debris can get into their feathers stripping them of their natural waterproofing and, consequently, their insulative capacity. Luckily we noticed a park ranger vehicle had pulled up to the beach and we went over to inform the rangers that two grebes and a Ruddy Duck were stranded. They phoned to get another vehicle over to collect up the birds and take them to a rehabilitation centre. 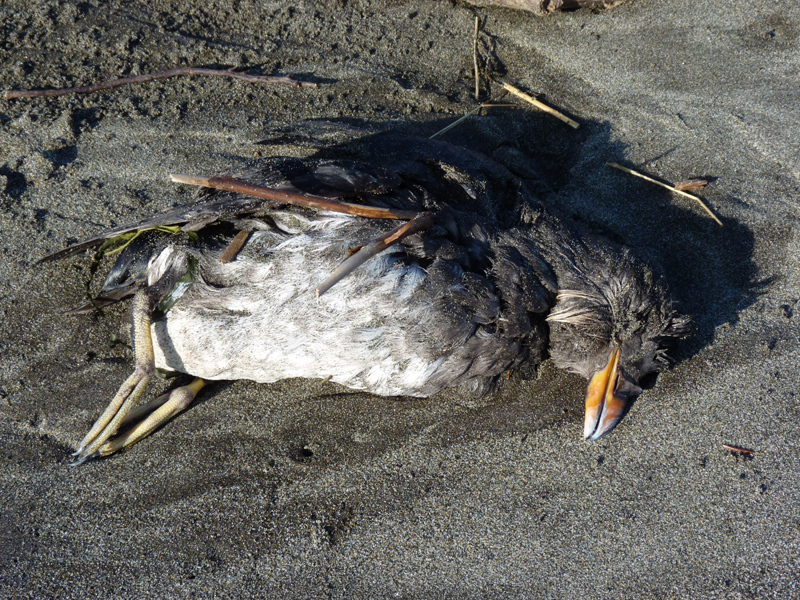 We walked along the beach to see what other birds were affected by the event and quickly found four Rhinoceros Auklets and two more Western Grebes, all dead. Additionally, we relocated the Ruddy Duck and were disheartened to see it panting with a dab of blood on its bill. Nathan attempted to scoop it up to safety but a big wave came in and pulled it back out to sea and the next wave sent it right back into the rocks again. Another attempt was made to get it, but the bird had a lot more life in it than we had imagined. We knew the outcome looked grim but we left it to nature to determine its fate. As we made our way back to the car, a couple of younger park rangers pulled up and headed to the beach with gloves and a box. We pointed out the two grebes and mentioned the Ruddy Duck down the beach was not looking good. They put the grebes in a box and transported them to the wildlife rehabilitation centre. We were happy to give the two grebes a fighting chance but the event left us feeling sombre. One of four dead Rhinoceros Auklets washed up following heavy winds off the Pacific coast. 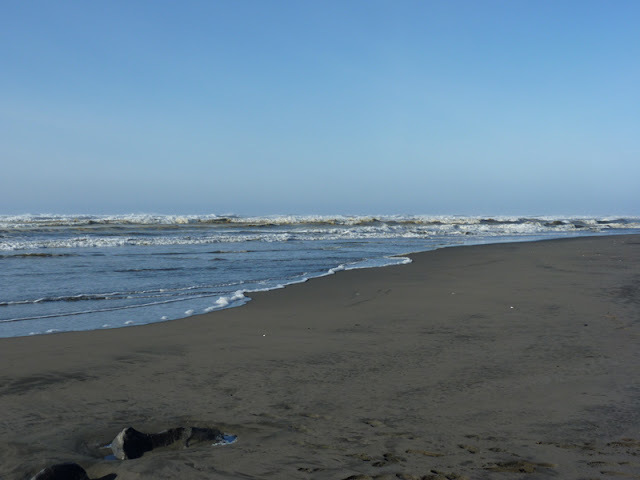 We proceeded to make the hellishly long haul back from Ocean Shores north to Delta with a couple stops along the way to keep our hunger at bay and our eyes open. Jeremy K. was a real trooper and drove the whole stretch. In Delta, we dropped off Nathan, grabbed one last coffee, and headed to the ferries. We were already too late to get the last ferry to Swartz Bay (Victoria) so we had to catch the ferry to Nanaimo. Even though it was an extremely long and tiring day, we made a brief side trip as we entered Duncan at 1:45 a.m. I had to take a quick pee break and Jeremy K. needed to stretch out his legs, so I suggested we take a slight detour that might give us a shot at owls in the process. As luck would have it, we spotted a Barn Owl cruising over a field right beside the road. That was the final bird of our epic adventure.